"As diplomats, we leave a bit of our hearts behind each country we get posted to. 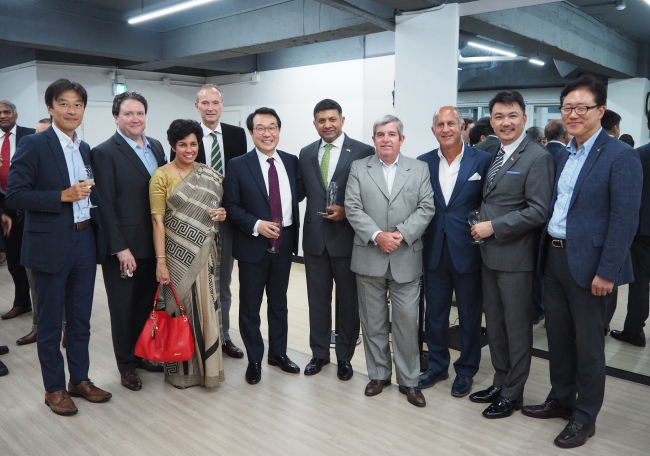 Korea was one important milestone in the lives of me and my wife Sangeeta." 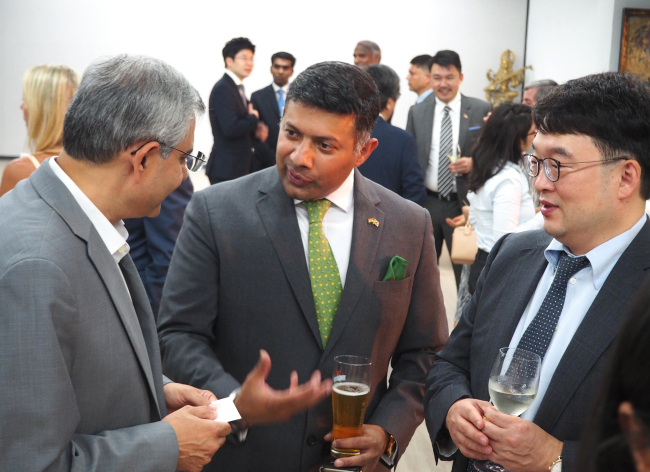 In Korea, where things tend to get done rather quickly, the three-year tenure of former Indian Ambassador to Korea Vikram Doraiswami went like lightning. 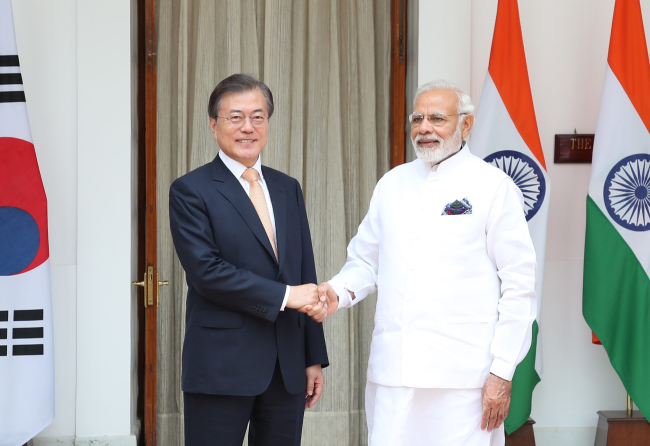 Soon after starting his ambassadorship here in April 2015, Doraiswami helped prepare the visit of Indian Prime Minister Narendra Modi to Korea in May of that year, laying the groundwork for the success of New Delhi’s “Act East” policy -- a core foreign policy initiative to deepen India’s engagement with East Asia. His tenure ended with the equally important task of accompanying Korean President Moon Jae-in during the presidential visit to India from July 8-11. Moon’s visit was the harbinger of Seoul’s New Southern Policy, which aims to strengthen and enhance the country’s relations with Southeast and South Asian nations to the level of four powers, the United States, China, Russia and Japan. Doraiswami’s tenure happened at a time when Korea has been striving to look beyond its immediate region to diversify its diplomatic, economic and security ties, while India has sought to reap the capital, technology and know-how of East Asian economic powerhouses. During the envoy’s 3 1/2-year posting here, nearly all of India’s senior ministers visited Korea, including the ministers of external affairs; finance; commerce and industry; science and technology; and defense. Bilateral trade last year grew by 30 percent on both sides from the previous year, reversing a negative trend that had started in 2011, according to Korean official statistics cited by the Indian Embassy in Seoul. Investment flows gained momentum, with Korean firms having plowed nearly $3.5 billion into India’s automobiles and auto components, electronics, chemicals and other industries. The two countries are also currently nearing their negotiation to upgrade the Comprehensive Economic Cooperation Agreement, a bilateral free trade agreement that entered into force in 2010. The aim is to improve the competitiveness of each side’s goods and services in their markets, and spur synergies in information technology and electronics, energy and shipbuilding. “My original connection to Korea started in 1994 when I started learning Chinese because half of my classmates were Korean,” he said, referring to his post at the Commission of India in Hong Kong as third secretary. The envoy was later assigned to the Indian Embassy in Beijing in 1996, where he served for four years. “I made some very special friends from that class, who fed me Korean food and drinks like dried anju (snacks served with alcoholic beverages) and poktanju (a boilermaker concocted from soju and beer). They also taught me traditional Korean culture and some expressions,” Doraiswami added, uttering a few popular Korean expressions that drew laughter from the crowd. “I want to emphasize that we Indians and Koreans are invested in our relationship, as evidenced by President Moon’s visit to India in early July, which reciprocated Modi’s visit to Korea in May 2015,” he said. “We agreed to work towards fostering a ‘future oriented partnership for people, prosperity and peace,’” the joint statement following the two leaders’ meeting said. According to the Indian Embassy, one key achievement of the visit was the completion of the Early Harvest Agreement, which would lead to an upgraded CEPA and help the two sides expand their trade and investment linkages. Moon and Modi noted the complementarities between the two economies, and encouraged their business communities to enhance investments, promote joint ventures and work toward the goal of raising bilateral trade to $50 billion by 2030. 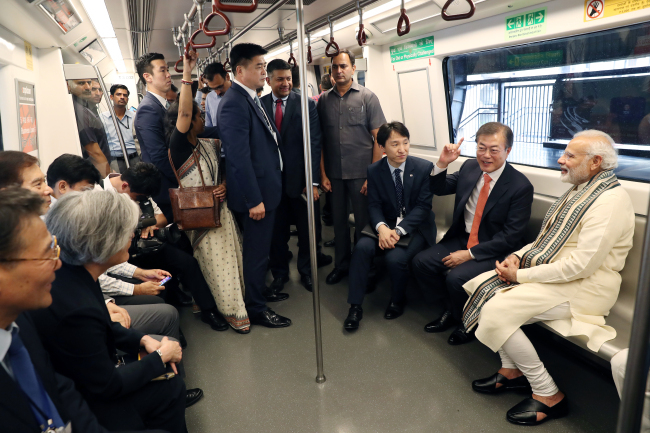 On July 9, the two leaders traveled together in the New Dehli Metro on the way to the inauguration ceremony for Samsung’s mobile phone-manufacturing factory in Noida, which is to be the world’s largest of its kind. They also welcomed new initiatives to foster closer people-to-people ties through youth exchange programs, internships and the facilitation of tourism and business on the back of simplified visas. In the defense sector, India and Korea vowed to enhance military exchanges, training and experience-sharing, as well as research and development involving innovative technologies. In science, they will conduct collaborations in renewable energy, material science, robotics, engineering and health sciences, among others. Doraiswami’s interests include reading, squash, hiking, travel and jazz. He speaks Chinese, French, English, Urdu, Tamil and Hindi, aside from limited Korean. He entered the Foreign Service in 1992 after a one-year stint as journalist. He worked at the Prime Minister’s Office in 2002, and later served as private secretary to the premier. In 2006, Doraiswami was assigned to the Indian Permanent Mission at the United Nations in New York as political counsellor, and in 2009, became the consul general in Johannesburg. The envoy is scheduled to work at the Ministry of External Affairs in New Delhi over the next few years.